That was the story on Sunday morning, and here is the story before and after Sunday. 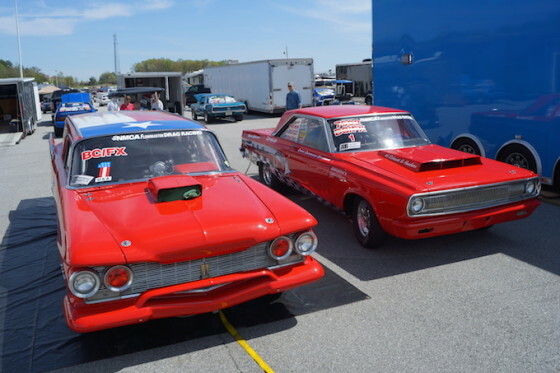 We were loaded up and left the shop at 9am on Wednesday — arriving at Atlanta Dragway at 3 am Thursday. The track let racers pit at noon Thursday and we set up, established credentials and teched the cars in through the afternoon. Dallas’ car hadn’t performed well since we stuffed a new bullet into it, but we thought we’d finally found the issue after Bradenton. Sadly we didn’t and there was only one opportunity for a Time Trial before the rain hit Friday morning. When it stopped they went into Qualifying. His car launches like a dog — then takes off like a raped ape. We thought is was fuel and changed carbs, fuel pump, and fuel filters; but that didn’t resolve anything. We also changed the converter — and that too didn’t change anything. We now suspect it to be ignition (taking timing out after the launch) and will change the box and distributor this weekend. Flat ran out of time before Qualifying because of the rain. I got my car in line as soon as they opened the lanes — and it ran a nice 9.60 without weight — perfect for my 9.75 Index. I was able to hot lap it back in line with weight — and ran a 9.749 — but when I checked my gauges at the top of the track I had zero oil pressure. 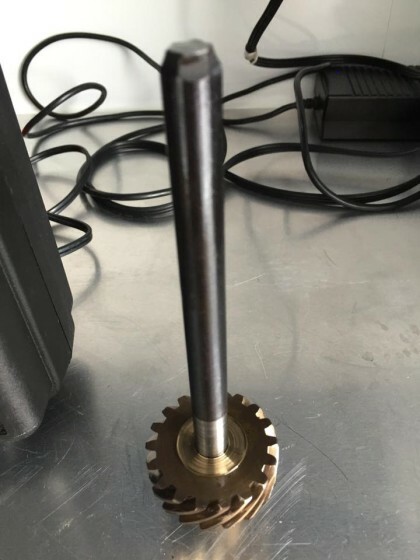 We towed the car to the pits for Dallas to pull the distributor and bronze pump gear — only to find the shaft snapped. It and the bushing were ground up pretty good. I suspect something went through the oil pump and that caused it to snap. I only have 40 passes on the motor. Anyway since I look at the gauge before I stage and can’t look at it again until I cross the line — I don’t know how long I was without pressure. The engine sounded good — but I have trash in it and need to have it torn down and freshened as I rather pay $5,000 than have a $25,000 loss like the last engine. So here we are with my engine blown right before Qualifying and Dallas’ car having a mysterious Gremlin that has it launch like a 13-second car and second half the Quarter like 9-second car. Dallas told me he was frustrated with trying to run his car as it wouldn’t be competitive — and since I was fourth in points after Bradenton — he offered to withdraw so I could qualify in it and be counted with those points and a first round loser (as the car wasn’t expected to get further). After ensuring that he was serious and really was good with it — we went to the tower to take him out, put me in, change Index to 10.0 and put a #1 on the car. Thanks boy — I’ll return the favor if we’re ever in the reverse situation. The first round of Qualifying happened at 2PM Friday. To make a long story short — I went 10.000 in that round, guarantying me the Top Qualifier for the second race in a row, and the small points coming with it. For the other two Qualifying passes I ran a pair of 10.03s, and the only reason I even ran them was to try to figure out how to get a better reaction time on a sick car. The first round of Eliminations was early Sunday morning, and I was paired against Geary Bates – who is a great racer, and who was running dead on. I’d set the car up to do a 9.90 so I could play the stripe. We both had decent lights — but mine was a little more decent. Because the car launches sick (which I forgot to mention to Geary), he didn’t see me at the mph cone and lifted for a 10.55 on a 10.50 index. I sped by and applied a little brake (trimming 17 mph) to cross the line at 10.03 and get the win light. We did the math and his car would have done a 10.50x and mine would have done a 10.001 – so I would have won anyway if we’d stayed in it — as I had a .020 better light. For Round Two I was paired with TD Holland. 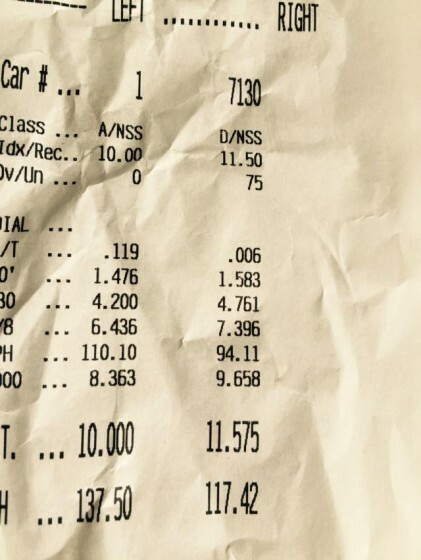 I didn’t have a good light and TD had a .012 light and ran a 10.003 for a .015 package from perfect. 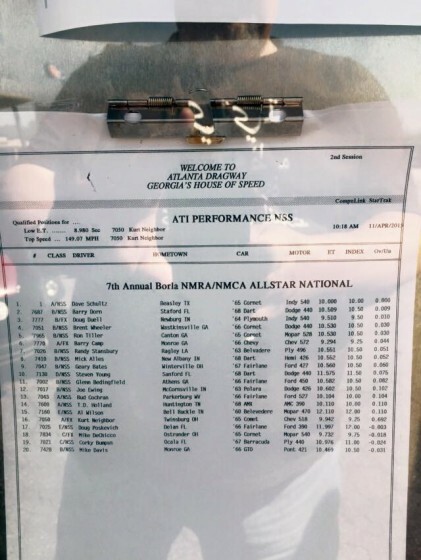 He got the bye from my Top Qualifying Position and ran Doug Duell in the finals — where he had an .005 light and ran a 10.003 again for a .008 package. When you’re hot – you’re hot. That will be the second time this year that the guy who beat me got a bye in the next round, and then won the event. We got back home (930 miles) Monday afternoon — and Dallas is busy getting things fixed (spare engine in my car – new ignition in his) so we can test both cars before the Dave Duell Classic next month. Again, thanks to my Product sponsors TTI Exhaust, Mancinni Racing, Fuelabs, ATI and Aerospace Components for their help. While on that subject — I want to talk brakes. The last time I raced the Big Red Ram was about 8 years ago — and it was a stick shift. It has Wilwood Brakes, as did the black car — and I never felt like either car stopped as well as they should. I have Aerospace Components brakes on the Vitamin C and the Whale, which are the two cars I’ve been racing in the last few years — and got very use to them. While driving Dallas’ car (which do have relatively new rotors and pads) I realized that it doesn’t stop near as well (both distance and smoothness) despite it being lighter and going slower than my wagon did. This really has me sold on Aerospace’s brakes. They’ve sponsored the brakes on the Texas Thug, which is in the process of being restored to be a backup car so the Vitamin C can be restored. That leaves Dallas needing to save up to replace his brakes — which I don’t expect to be soon since he’ll be getting married in October. We run Aerospace Components Vacuum pumps on all of the cars, which I bought before a sponsorship. I mainly did that because the billet looks better under the hood, and the kits are easier to R&R. I originally bought two as factory rebuilds on eBay (Aerospace Components the seller) for my wagon and the Vitamin C. I liked them so much I sold the Moroso on the Coronets and bought three new ones when they were running a sale. I mention this to those needing brakes on fast cars — so they get the best the first time. Also a vacuum pump can be worth as much as 30 hp on a quick car. I received a flier in my email telling of a 15% discount and free shipping going until end of the month. This might be the time for some of y’all to upgrade to the better stuff. Tell them Dave Schultz sent you when you call.